Orofludio Prive Topbox - The Orofludio Prive Topbox is for all hair types. Three natural oils - argan, cyperus, and linseed - in an exquisite mixture with a pleasant, silky texture that is rapidly absorbed and does not add weight. It contains UVA/UVB filters to protect hair from the damaging effects of the sun. Catherine Malandrino Prive Topbox - Nothing says haute-chic like Catherine Malandrino Style de Paris Prive Topbox. Blending notes of ruby red grapefruit, orange blossom, and Nashi pear with violet and patchouli. It's the perfect blend of chic Parisian style with the irresistible energy of New York. Bioderma Prive Topbox - Bioderma Prive Topbox, contains Bioderma Sensibio H2O, the 1st and only dermatological micellar water perfectly compatible with the skin: its fatty acid esters, the constituent element of micelles, are similar to the phospholipids of the skin cell membranes, and naturally help rebuild the skin's hydrolipidic film. Bioderma, Sebium AKN, Anti-Aging Resurfacing, Purifying Care, an anti-aging, resurfacing and purifying treatment that biologically prevents the appearance of blemishes and wrinkles in one step. Scented formula, hypoallergenic, paraben-free, non-comedogenic. Jelly Pong Pong Topbox - Jelly Pong Pong Prive Topbox, contains Lychee Gel, a softening shower and bath gel infused with delicious lychee-lemon scent that cocoons you in a delicious cloud of fresh tangy lemons and sweet, ripe lychee fragrance. The ultra-gentle formula produces a luxurious, silky foam that cleanses without drying out your skin. Made without parabens. Jelly Pong Pong, Supermodel Stain, lip and cheek pomade, an air-whipped creamy pomade that blends seamlessly onto your lips and cheeks for 12 hours of long-lasting wear. Powered by a vegetable- derived Ceramide Complex to help keep skin moisturized and enhance skin elasticity, and Wild Rose wax which helps heal chapped and dry lips. 100% Cruelty Free. Mirabella Prive Topbox - Mirabella Prive Topbox contains a creamy, moisturizing lip pencil with fluid-like texture creating a flawless satin finish with intense, long-lasting colour. Vitamin C and E Additives, Paraben-Free. Mirabella Eyeshadow Pigment Powder, is a loose wet/dry pigment powder which creates a long-lasting wash of colour. Weightless, soft texture can be layered for more intensity. I felt like the prive choices weren't all that great. The Catharine Malandrino perfume sounded like it was right up my alley until I got to the patchouli description. I'm not a fan of that scent, so I decided against that box. I don't need any more hair oil because I have so much of the stuff. 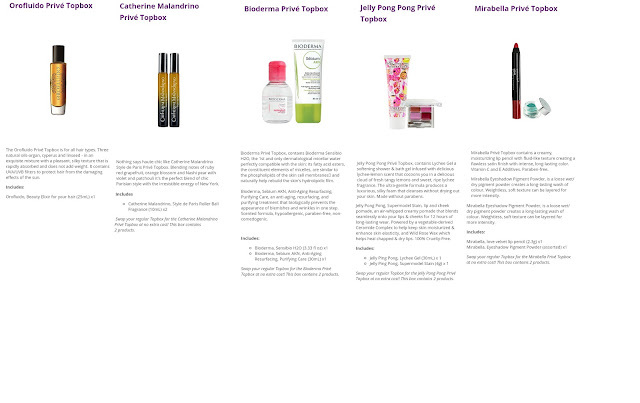 I'm not a fan of lip/cheek stains, and I already have the lychee gel that I still haven't tried. And with the Mirabella box, I'd be afraid of the shades they would send. I have already received an eyeshadow pigment from the Luxebox that I don't like the colour of. So, the only other box I was really interested in was the Bioderma. 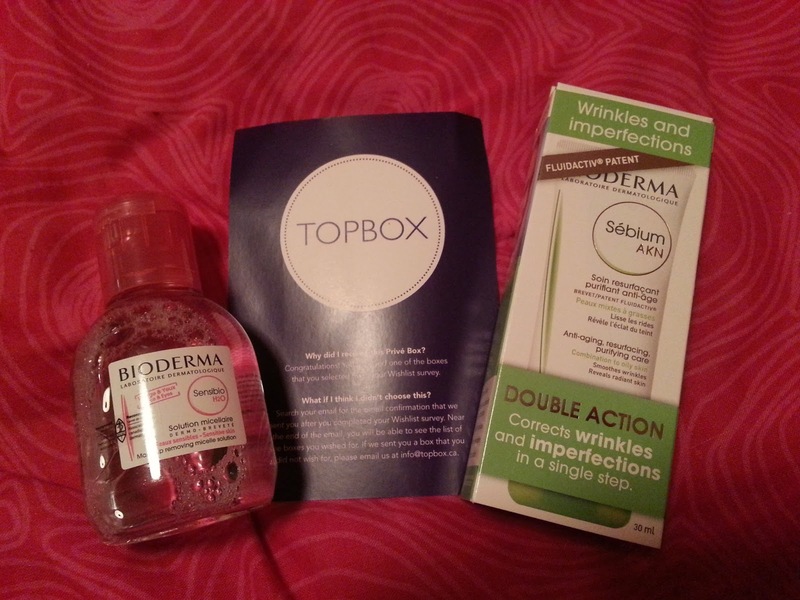 I made a wish for the Bioderma box, or regular topbox. And the Bioderma box is what I received! I already know that I love the Sensibio H2O Micellar Water! I actually ran out of my last sample sized bottle and purchased the Garnier version. Both are great, so this will be great for travel, or to use when I run out of the Garnier. I've never tried the Sebium AKN, Anti-Aging, Resurfacing, Purifying Treatment before. But I'm looking forward to giving it a try. The box says that it should be applied once or twice a day to skin, after cleansing with Sebium Foaming Gel or Sebium H2O, and that it is an excellent makeup base. I am a little scared because it says it is for combination to oily skin... and I have dry skin. But I think if I use this with hydrating products, it won't dry my skin out. At least I hope not! I will have a more thorough review of this when I can finally use it, I have some other products I'd like to finish first! I don't think I have many wrinkles (at least not yet) but it never hurts to try and prevent them, right?! Overall, I'm happy I chose the prive box. I can't wait to see what our options will be for September! 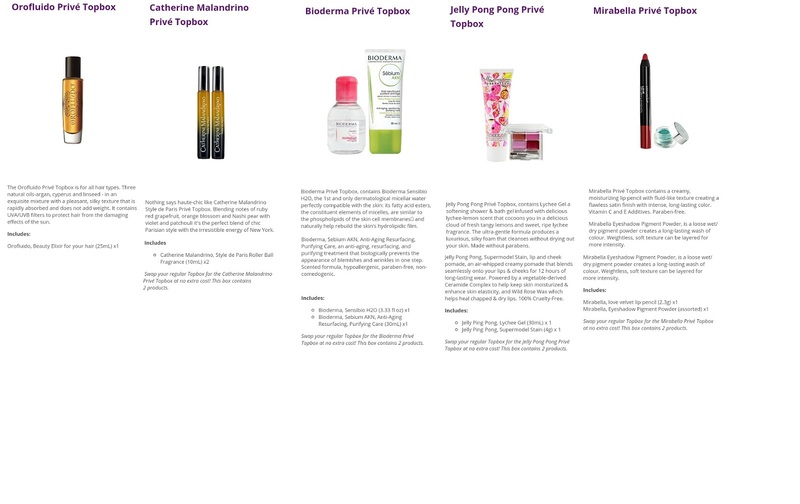 I think Topbox gave one sneak peek so far, and one of the prive boxes will be China Glaze Nail Polish. How exciting!